Soup is one of the simplest and easiest forms of food to get right. Virtually any ingredient can be used in a soup although there are of course several tried and tested combinations that have proved to be enduringly popular. There are hot, thick spicy soups and tangy, refreshing cold soups. Soups can be chock full of chunky vegetables and grains or they can be blended and strained to give a perfectly smooth texture. They can be flavoured with succulent herbs or rich meaty stocks. They might include pasta or beans or rice and be garnished with drizzled herb oil, a spoonful of sour cream or crispy seaweed. The possibilities are so broad that everyone should be able to find a soup they like. In French cookery, most soups start with a base called mirepoix, a mixture of diced onion, celery and carrot which provides a reliable baseline of volume and flavour from which to build. 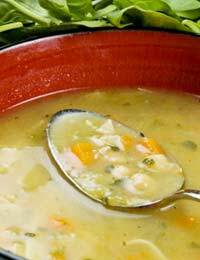 Soups are also a great way to use up any leftovers you might have hanging around in the kitchen as well as vegetables that need to be cooked before they go off. Bones from the carcasses of poultry which would otherwise just be binned are ideal for making stock. Fish bones can also be used to make a fish stock which can be added to seafood soups such as chowder or bouillabaisse but when doing this, it is important never to let fish bones cook for more than forty minutes as they will begin to release an unpalatably bitter flavour after that. One of the advantages of making soup is that it requires little more effort to make ten portions as it does to make two. This makes it a great idea for those living on a budget as delicious, nutritious soups can be made in bulk and then frozen until they’re needed. One thing to bear in mind when reheating frozen soup is that food loses some of its flavour in the freezer. This can easily be counteracted by adding a little more seasoning. As with all frozen food, make sure it is piping hot before serving. Vegetable stocks for adding flavour to soups can also be made quickly and easily from the trimmings left when preparing any vegetables. The tops and tails of onions, carrots and tomatoes can be dry-fried (without oil) briefly in a hot pan and then covered with water and gently boiled for an hour before being strained. This kind of stock has far more flavour than any dried bouillon powder. Many other vegetables can be used for this but green vegetables such as broccoli and courgette should be avoided as they will make the stock taste bitter, as will bell pepper. A delicious asparagus and parmesan soup can be made from the woody stalk of asparagus and the heel ends of wedges of parmesan. There are several other soups that can be made with just a couple of different ingredients but still offer tons of flavour. Broccoli and stilton only need to be added to water and blended when cooked to produce an amazingly tasty soup. Carrot and coriander are likewise a simple but very effective combination. In terms of simplicity there are few dishes anywhere in the world that offer the return of hearty food with as little effort as is required to make a leek and potato soup. Simply fry some chopped leeks until they are soft, add vegetable stock and peeled potatoes and simmer slowly for almost an hour. Blend or leave chunky according to preference. A hand-blender or stick-blender is undoubtedly the most convenient way to blend a whole pot of hot soup, but for those who only have access to a traditional box blender the following advice should be heeded: When blending hot soup, never fill the blender more than half-full as the heat energy in the soup will cause it to be more volatile and could result in it blasting the top off the blender and erupting across the kitchen. The risk of this messy and painful result can be avoided entirely by waiting for the soup to cool before blending. There are several different ways to thicken a soup. A roux, formed by mixing warm butter and flour with a wooden spoon, can be added to the mirepoix and will emulsify with any liquid added later giving a thick, sticky texture. Cold water can be added to cornflour and quickly mixed to give a thin white liquid with almost magical thickening properties. For blended soups, a better option than either of these is simply to add a few extra peeled potatoes to the pot with the stock to give it extra body. Many beans, when crushed, can give a similar effect.